Last week, Panasonic announced a new point-and-shoot camera with built-in Wi-Fi. The 12-megapixel Panasonic LUMIX DMC-FX90 has a fast 5x f/2.5 24mm wide-angle zoom lens, full HD video and a 3-inch 460k-dot touch screen LCD display. Those features alone add up to a great pocket camera. But of course, what really sets the FX90 apart is its Wi-Fi capabilities. The FX90 Wi-Fi is very similar to the Eye-Fi SD memory card system. It connects to a computer via your home Wi-Fi network and it can also connect to your mobile phone is designed to connect to your Android or iPhone smart phone with the free Lumix Link app. The app allows FX90 users to wirelessly transfer photos to their smartphone and then immediately share them online. That way you can share photos taken with a good camera instead of your camera phone. For reference, you can read my Eye-Fi Mobile X2 SD memory card review. I love using the Eye-Fi card to transfer photos to my phone and then post to the Web wherever I am. The Eye-Fi card works well once you get it set up right. But the setup process is anything but simple and intuitive. Building the Wi-Fi into the camera should make setup and operation a lot more user-friendly than the Eye-Fi card. 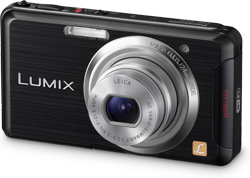 Pricing and availability for the Panasonic Lumix DMC-FX90 have not been announced yet.